The All Saints Fund is our annual giving campaign that supports programs that are critical to the All Saints experience. Donations to The All Saints Fund are the additional investment of resources that ensures that we can continue to provide an innovative, creative, and memorable student experience that inspires and engages. 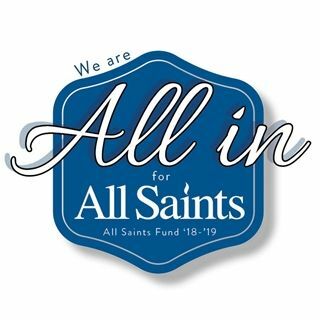 The All Saints Fund strengthens and sustains our operating budget as the cost of tuition does not fully fund our school. Gifts to The All Saints Fund enable our school to continue to provide the very best educational experience for our students. We ask all families to please make All Saints one of your philanthropies of choice. We already pay tuition, why do we need to donate money to the school? The All Saints Fund helps keep tuitions as low as possible. Like almost all independent schools, tuition does not cover the full cost of an All Saints education. Funds raised through the The All Saints Fund bridge the gap between tuition revenue and the cost of running the school, and provides the added resources in order to take our school from good to great. 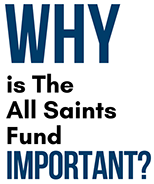 Who gives to The All Saints Fund? Everyone in the All Saints community: parents, grandparents, alumni, Board of Trustees, faculty and staff, and friends of the school. What you give is entirely up to you, but we hope that All Saints will be a philanthropic priority for every All Saints family and ask that you make a gift that is meaningful to your family. No gift is too small and every gift is important and appreciated. Last year, the average gift size was $250, with gifts ranging from $15 to $10,000. Many companies will match charitable contributions by their employees. The company helps to support worthy causes and the employee can maximize the amount donated to the charity. Many All Saints parents work for matching gift companies—please check with your human resources department or your employer to see if they will match your gift. If your gift is matched by your employer, the matched amount will be counted towards your total giving and acknowledged as such in the Annual Report. What impact will my small gift have? Every gift, regardless of size, is important and appreciated and brings us closer to reaching our fundraising goal. Gifts of any size inspire more people to give; they are a vote of confidence in our school and our community. 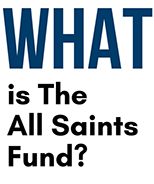 What does the money from the The All Saints Fund go toward? How will my Annual Fund gift be acknowledged? Your gift will be acknowledged in the Annual Report, which is distributed each spring and lists all donors to the school. If you prefer, you can make your gift anonymously by directing the Development Office to not list your name. If your gift is matched by your employer, the matched amount will be counted towards your total giving and acknowledged as such in the Annual Report. Why not simply raise the tuition and eliminate The All Saints Fund? 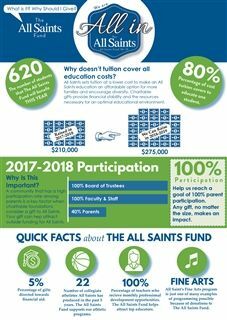 Like most other independent schools, All Saints relies on The All Saints Fund income to bridge the gap between tuition revenue and the expenses associated with operating the School. In addition, gifts to The All Saints Fund are completely tax deductible while additional tuition would not be.